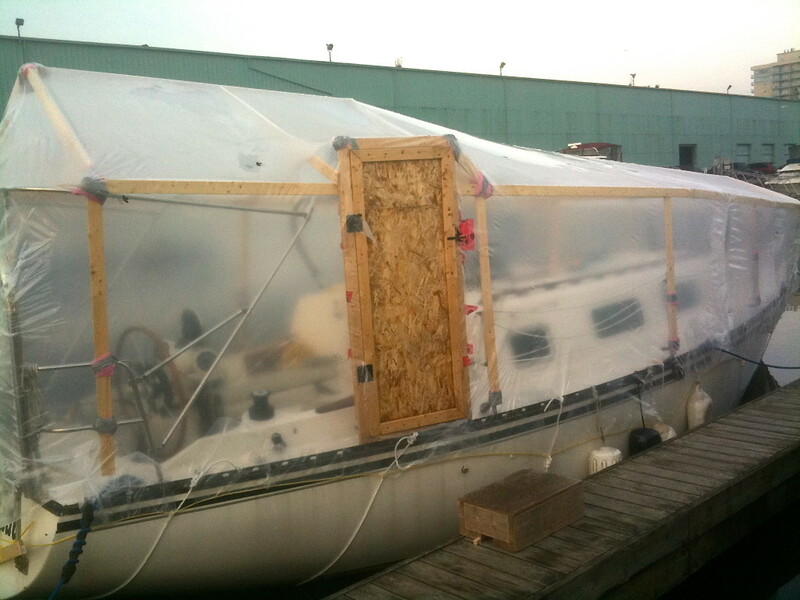 Whether you are storing the boat in a yard or living on it year round, at some point you will have to shrink wrap the boat. 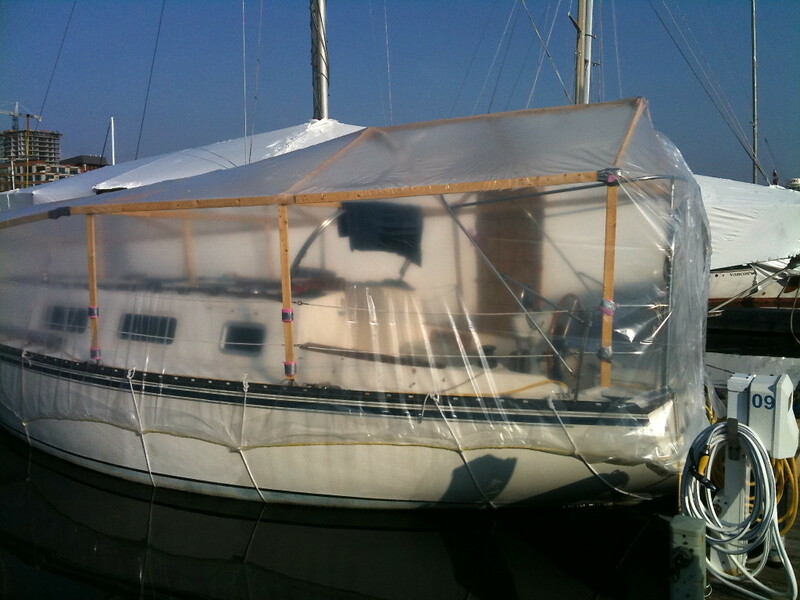 When living on the boat in the northern climates, it creates a nice green house effect that traps the heat from the day in the boat. It gets warm enough on the deck area to sit about in a teeshirt on the nice sunny days. In the following photos you can see the shelter I built has a wood door that allows me to step on and off the boat easily. There is a trade off in strength if you build the structure too high. I wanted enough room to be able to stand up and work on the deck, but not too tall that the strong winter winds would catch the side of the plastic and destroy it. You also want to build a high slope to the frame so that snow slides off. The front area of my framing could have used a bit steeper slope so there was a few times I had to get outside and shovel the heavy snow off the top. The wood I used is the cheapest I could find at home depot. It is not that expensive at around $50 a bundle I believe. I bought the green galvanized screws that prevent rusting. 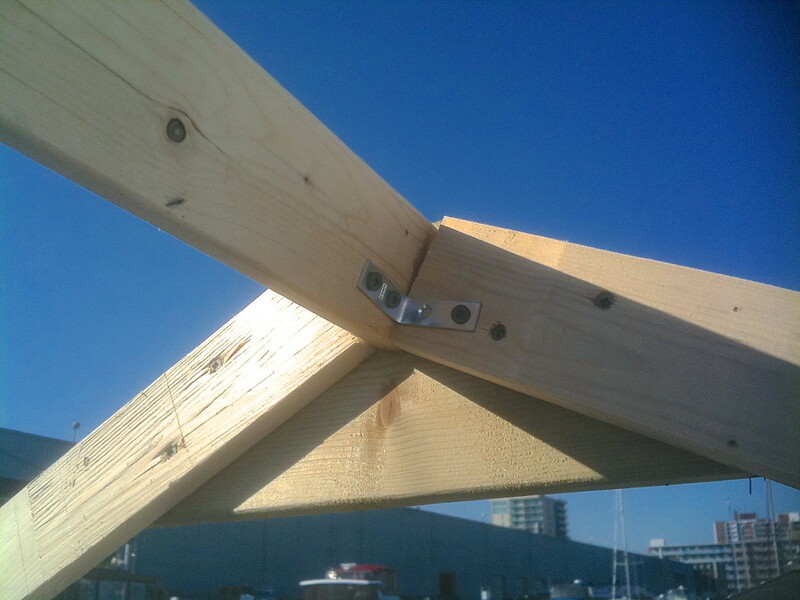 If you drop a screw somewhere on the deck, you will eventually find it next spring along with a nice rust stain on your fiberglass. 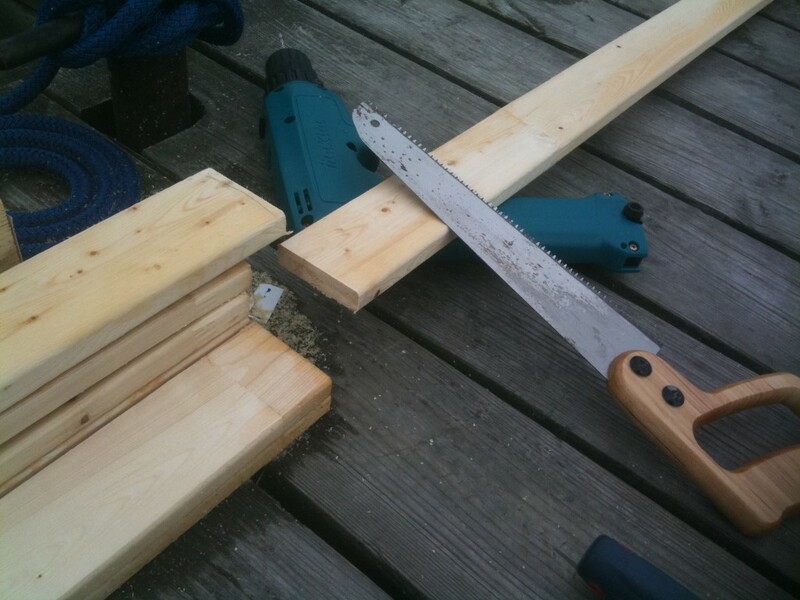 The wood tends to split unless you pre drill a hole first. Be careful that you dont drop your tools overboard. I start by building up the vertical sides. Working around the boat where each stanchion is. 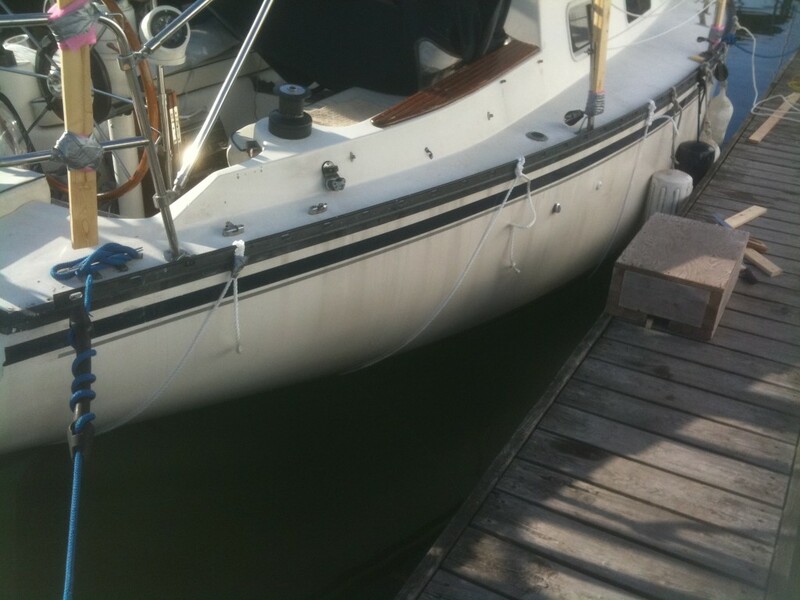 For the front of the boat I dont use the full length of wood. You want to taper it down to help create a slope. 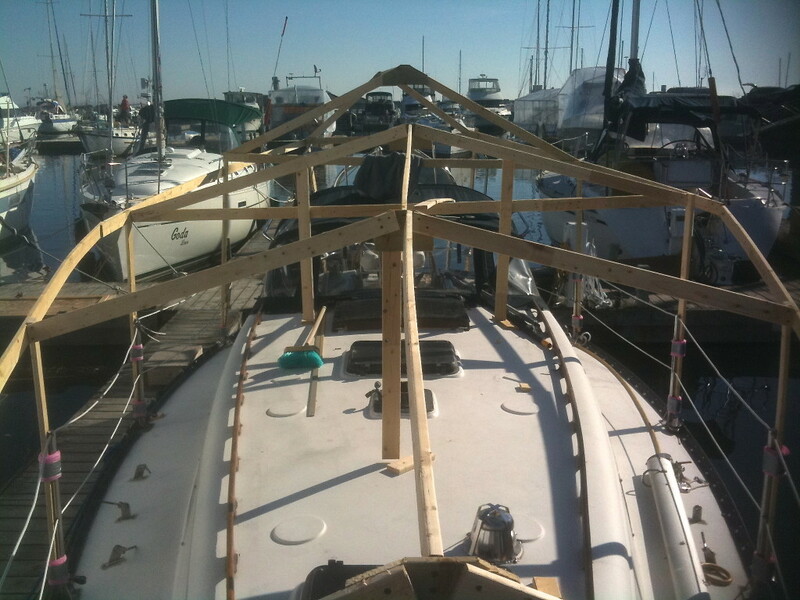 It is actually a little easier if you still have your mast up as you have a strong center pillar to build around and give the structure some stability. Once you have the vertical pieces up, connect around the perimeter. Its okay to be sloppy, nobody is going to see the handy work once its wrapped up. You just want to make sure the wood isn’t splitting anywhere. Don’t worry about the screws poking out the other side of the wood. You can buy a roll of pink insulation at home depot and wrap any sharp wood edges or exposed nail points with this foam and duct tape. Vertical pieces are attached to stanchions with this piece you can pick up at home depot. Now that the frame is ready its time to add the belly lines. The belly lines are 3 or 4 nylon ropes you run from toerail to toerail. 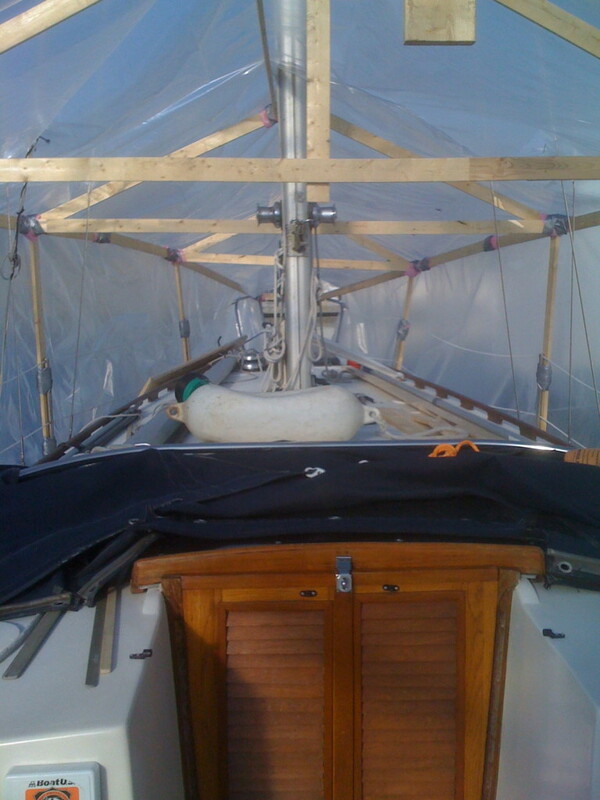 We use it to keep the shrinkwrap plastic from slide up and off the boat in the wind. 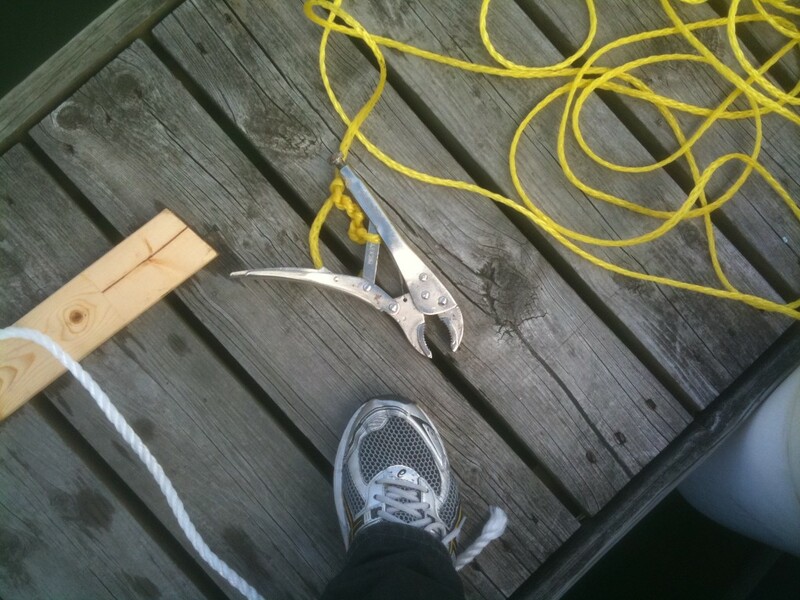 To get the line under the boat, tie one to the toe rail and you can walk it around the nose on the deck. 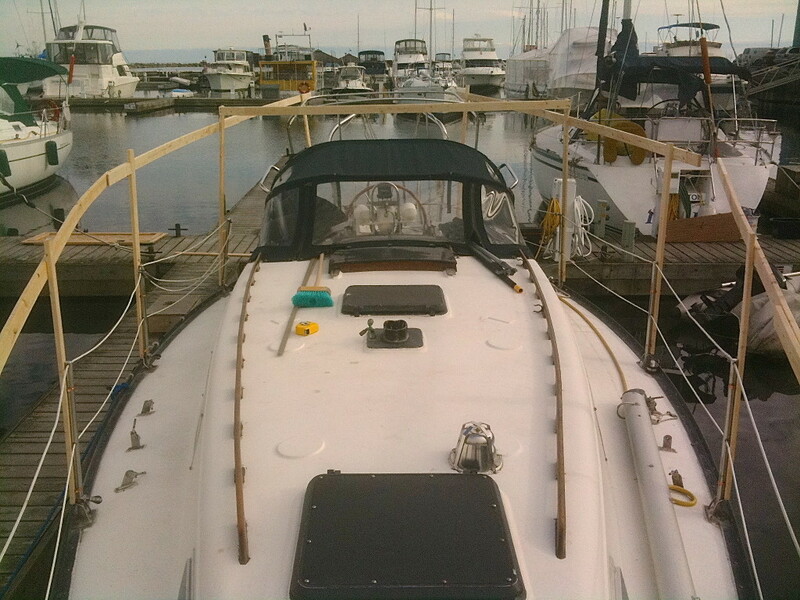 It is a bit trickier to do near the center of the boat and you may have to work around the rudder. The nylon line (which you can also get at home depot) has a tendency to float. 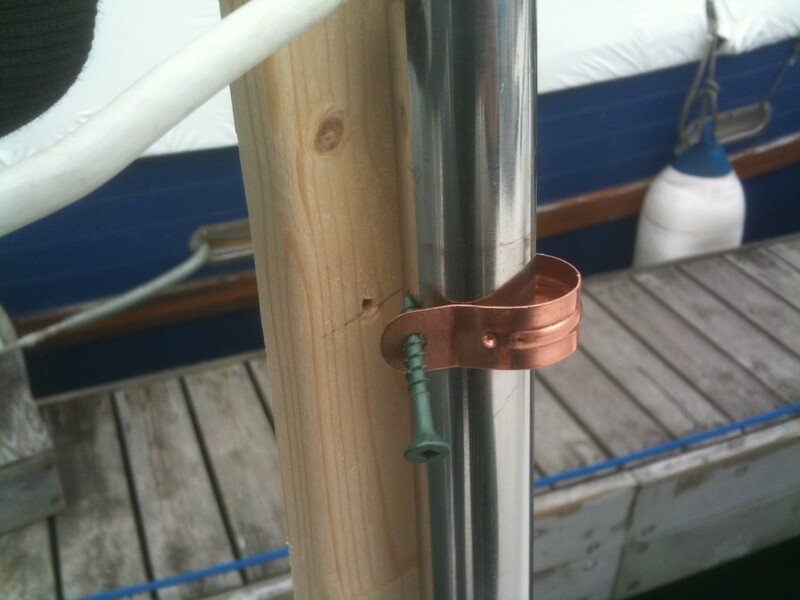 A trick I learned from my boat neighbour was to tie another line to a vice grip plier and snap it around the line you want to weigh down under water. It will drag it down so you can get under the keel if needed, then when you need to retrieve the pliers you can just pull it up again from under the water. Vice grip weight to drag the belly line down. Once you have the belly lines nice and tight, we need to run another horizontal line around the perimeter of the boat just a foot or two below the toerail. 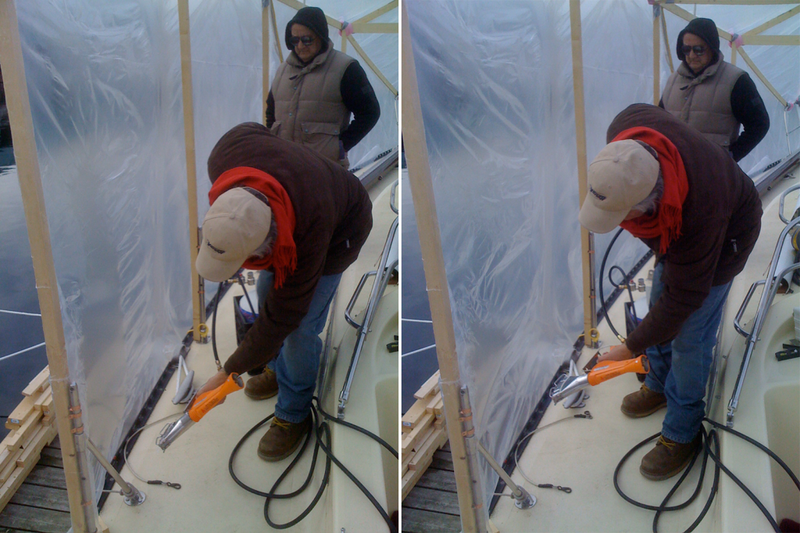 What we will do is when you lay the plastic over the boat and let it hang over the sides of the boat, you will trim a foot or two below the perimeter. Then fold the plastic up between the horizontal line and the boat. The lines should be tight so tucking it under should hold it well until we melt/fuse it together later with the propane heat gun. White belly lines, and a yellow perimeter line. In the photo above you can see the white belly lines, and the yellow perimeter line. 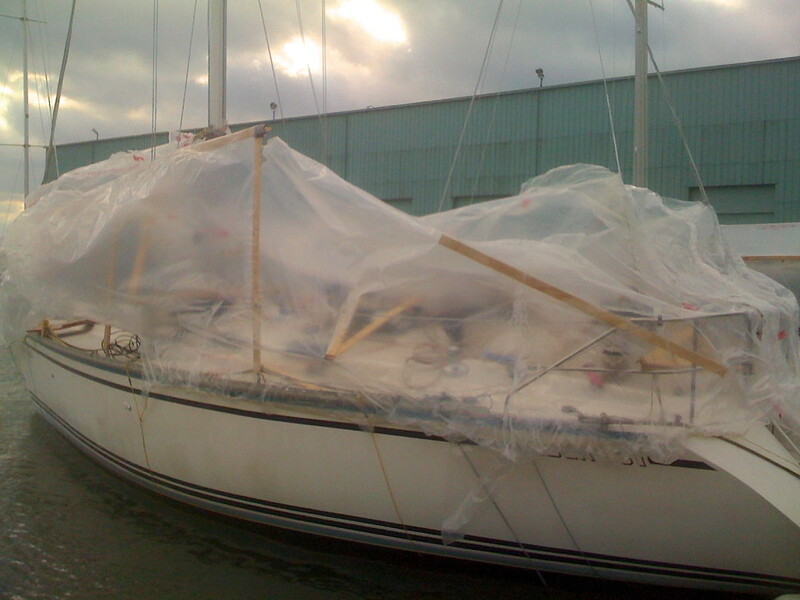 The plastic hangs over the yellow perimeter line, and tucks up between the boat. With a heat gun we will do a sort of weld at this point and is the key point that keeps the whole plastic cover from slide up off the boat. 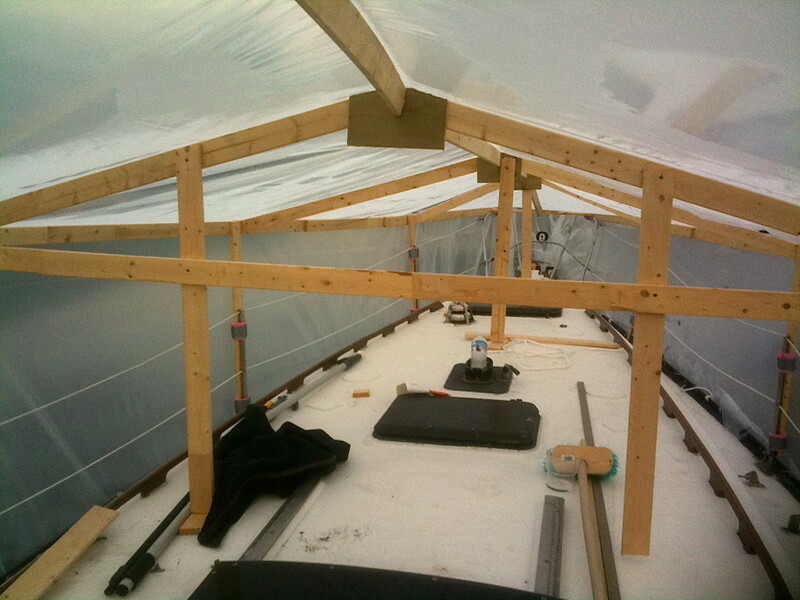 You can get creative on the bow and stern of the boat tucking under the anchor rollers or on the boarding ladder. Make sure your belly lines are tight too. I always tend to do this late in the season, in early november and its a bit chilly on the fingers. I had to borrow a neighbors dingy to work around the side of the boat away from the dock finger. You are now ready to start covering the boat. This will take a bit of hustling around on the deck as the plastic is pretty heavy. As you unroll the plastic it will be a bit easier to manage, and it will help if you have an extra pair of hands. 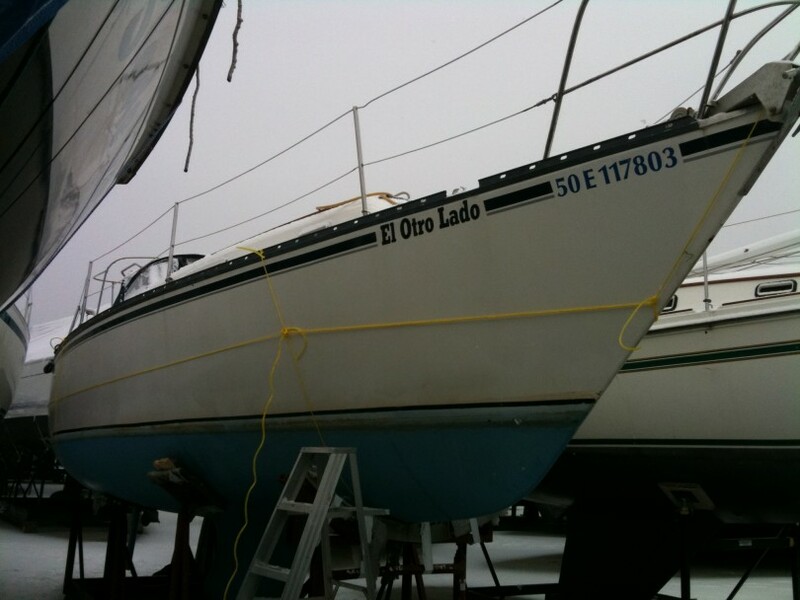 If you still have your mast up you will have to cut a slit from from the center down to the side to fit the mast in. 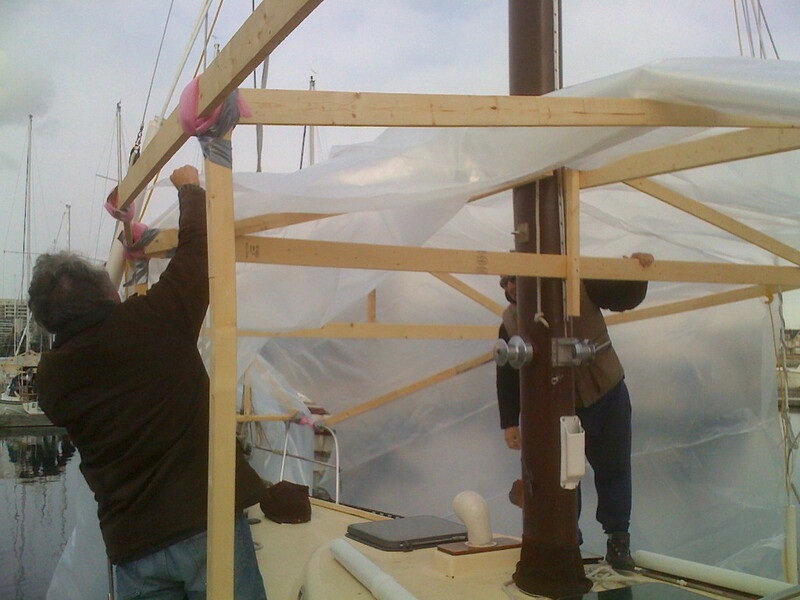 We will connect the cut tarp together again around the mast afterwards. You will have to cut slits anywhere you have any stays protruding through the plastic. To “weld” the plastic, just overlap the ends, fold it over a few times and staple it together. When you go over the area with a propane gun you can heat that seam up and let the plastic melt together in a water tight seal. The pay off is getting to use the propane gun and seeing the plastic tighten up like a drum. It gets really strong when it does this and as the frame contracts under the stress of the plastic, it really gets solid. 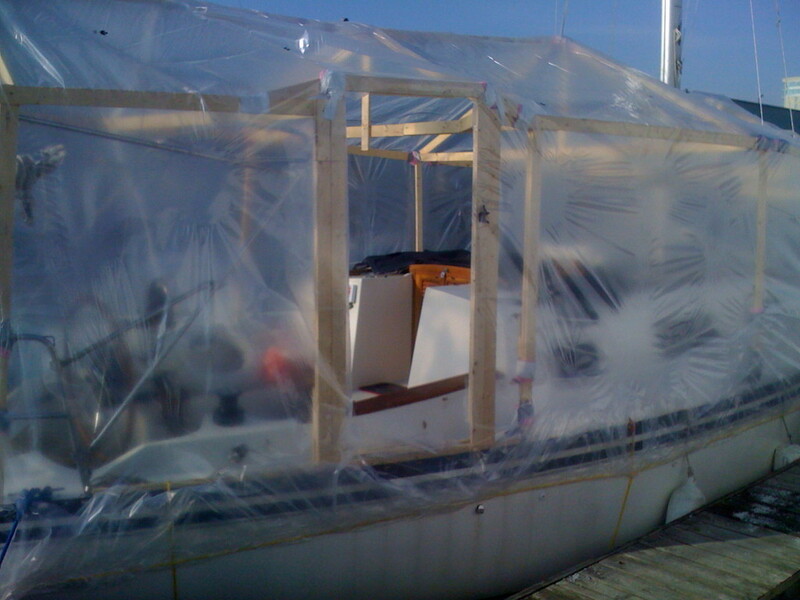 What I would start with first is sealing the plastic around the perimeter of the boat. 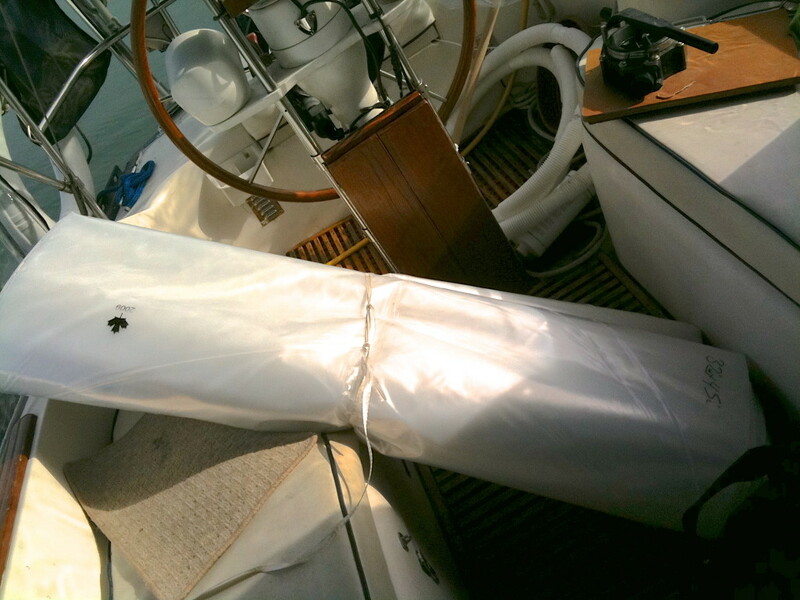 Trim the excess plastic and tuck it up under the horizontal line you secured around the boat. Heat the plastic up with your heat glun and pat it with a thick leather (hopefully heat resistant) glove to let the plastic to melt secure onto the line. Work your way around the boat. Then seal any slits you made along the top, or for the door opening. You can then move on to the large flat areas. You want to make sure you get all the large areas nice and drum tight or you will get it flapping in the wind. You will have to work quick and not hover too long in one spot or the plastic will melt forming a hole. What you want to do is keep the gun a foot or two away and move across the plastic. You will get a hang of it pretty quick. I use a propane heat gun for everything. Don’t bother with the electric heat guns, they just dont have enough power and you will spend 2 weeks trying to heat it up. If you do burn a hole through the plastic, dont worry. I usually have a roll of red ‘tuck tape’ available for patching holes. This is strong stuff so only use it on the plastic. 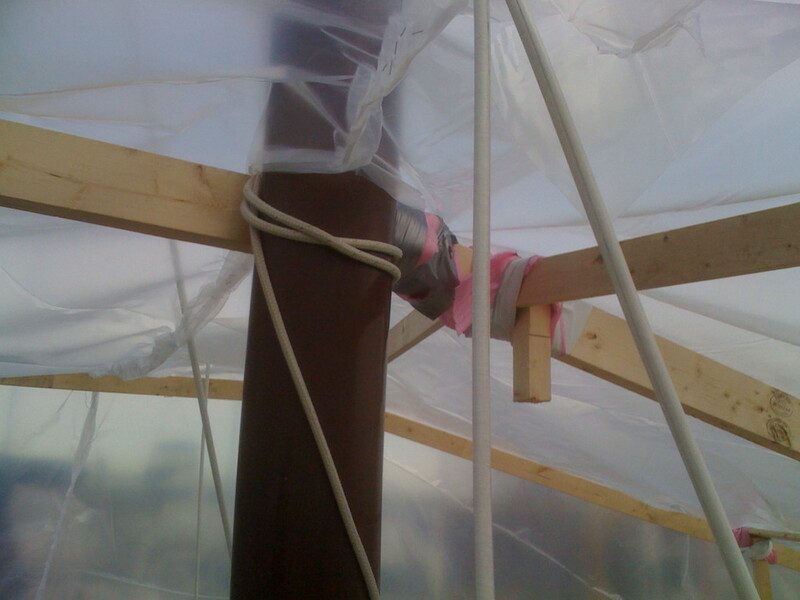 Dont make my mistake of using on any part of the boat as the red tape and glue will never really come off ever. If you have any large holes, its simple to make a larger patch using left over plastic wrap. There is always tons of plastic wrap left over that you end up throwing away anyways. 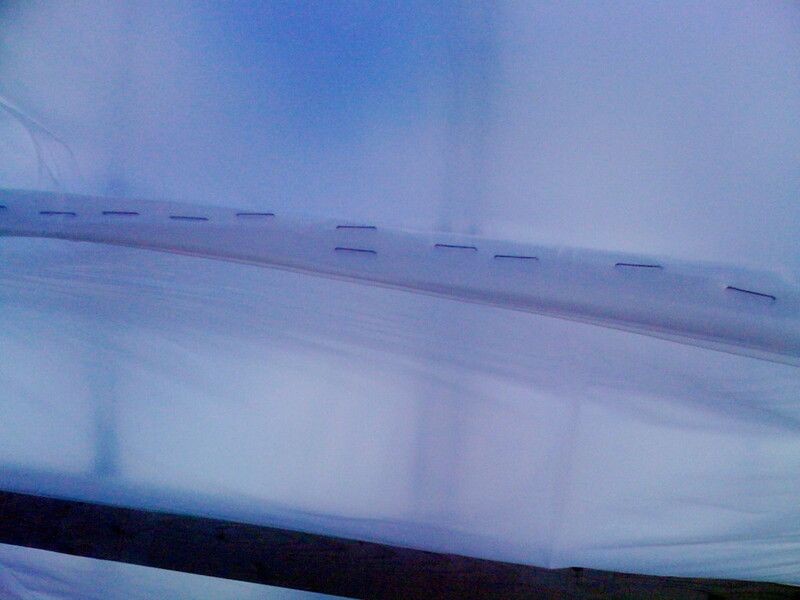 I usually keep a bit of extra plastic around for patching seams that split later on in the winter. It even works great when working on fiberglass projects. Fiberglass wont stick to it so you can use it as a dropcloth, or even a mold release. Plastic wasnt drum tight, and flapped in the wind until it was destroyed. It is a lot of work and will take a full afternoon or even a whole day, but its worth it when its all done. 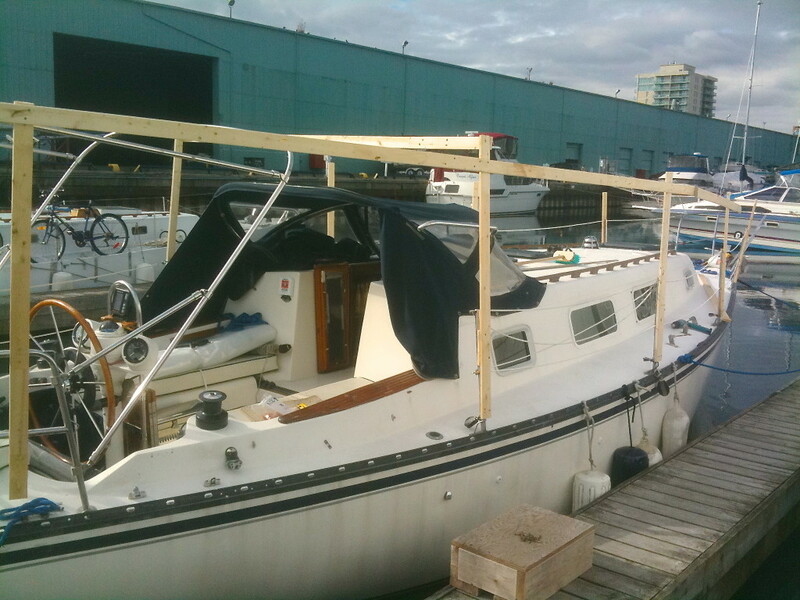 You will have a nice toasty warm boat to survive the winter in. Toasty and warm in the plastic bubble.